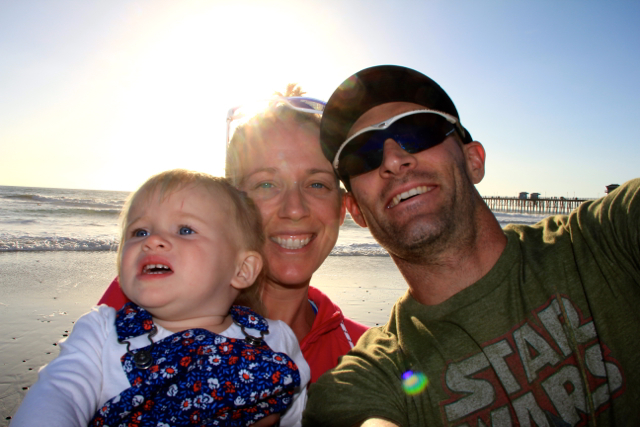 After an action packed few days in Oceanside, CA, I have had some time to recap the weekend. 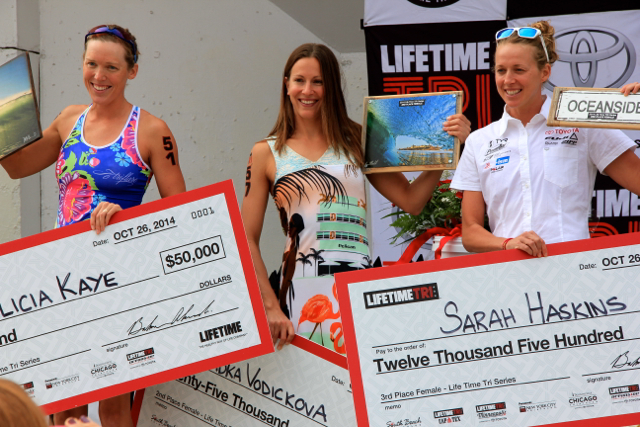 I finished the race in 3rd and ended up finishing 3rd overall in the Lifetime Series. I was more than thrilled with my finish! The trip started with an early morning flight from St. Louis to Phoenix, Phoenix to San Diego and then made the 45 minute drive up to Oceanside. 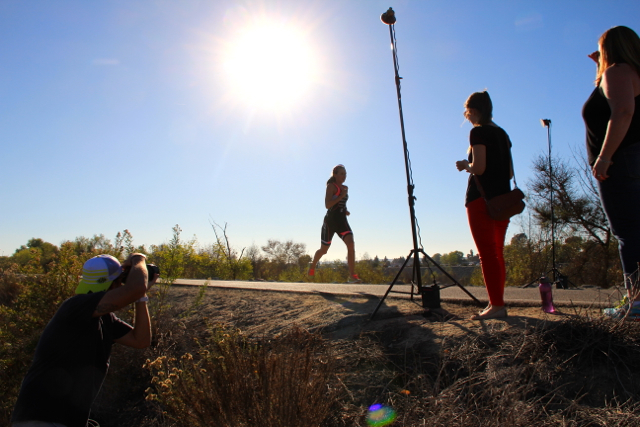 After a quick change, we had a family photo shoot with Triathlete Magazine. Despite Caroline having an incredibly long day, she was a trooper and had some great smiles for the camera. After the photo shoot, Nate and I attended a sponsor dinner with Mike and Jenn McGuire and friends from Lifetime and Toyota. My parents made the trip and were able to watch Caroline while we attended the dinner. Needless to say, Nate and I hit the pillow pretty hard Friday night after hitting the go button for over 20 hours! Saturday morning, I completed a bike warm-up and a quick swim in the ocean. Surprisingly, the water was warm…for the Pacific! It was 71 degrees, which meant the swim was non wetsuit. In the afternoon, I hung out at the Toyota booth and attended the pre race meeting. After an early dinner, I packed for the morning and was excited to get to bed at 8pm (which felt like 10pm CST). I must have been subconsciously nervous for the race the next morning, because I laid in bed for over 3 hours before I finally fell asleep!!! I have never competed in a race before with such little run training, but I had different goals and expectations this race. I was not racing to win, but rather just to get out there and have fun, push myself and try to maintain my fifth place in Lifetime Series. When the alarm went off in the morning (actually I woke up just before the 4:20AM alarm), I did not feel too tired since my body felt like it was 6:20AM. I woke up excited to go and ready to race; something I have not been able to do since June! I had a Strawberry Banana Power Gel 15 minutes prior to the start for some quick pre-race energy. This swim took place in the Marina, so it was very calm. It was a deep water start and it was chilly waiting in the water prior to race start. I wore my TYR syonara swim skin. I did not have the best start. My muscles felt a little tense, but after about 400 meters, I felt like I got into a groove. I ended up swimming with a group consisting of Katie Hursey, Paula Findley and Alicia Kaye. I exited about 15 seconds behind leader, Lauren Brandon and Sara McLarty. I had a smooth T1, and got on my Norcom Straight. My race wheel set up consisted of my Zipp Firecrest Carbon Clinchers; 404 Front and Super 9 Disc. After a technical start to the bike, the middle section consisted of smooth roads and I was able to push hard. I road most the bike in second position and at halfway through the bike, I was 30 seconds behind Alicia Kaye. The last part of the bike was on bumpy, narrow roads. I road this section very cautiously, as I wanted to not take any risks. I also had to watch out for morning surfers crossing the bike course, heading out for the waves. The last third of the bike, I lost considerable time to Alicia (90 seconds), which made for exiting off the bike in second with 2 minutes down. Check out my Quarq power file presented by Training Peaks. 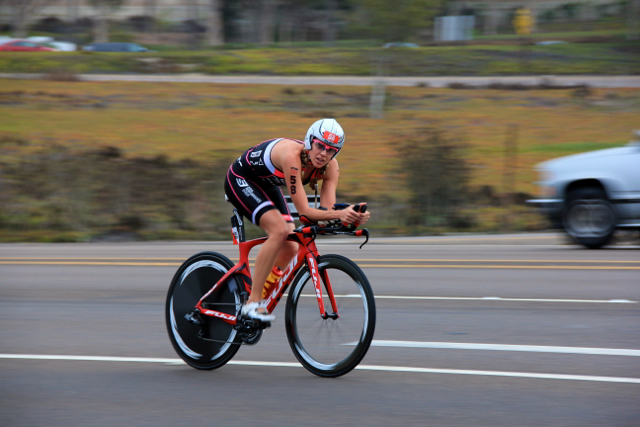 I was happy with my position off the bike, but not confident in how my legs would feel running. While on the bike I drank 20 oz, filled with one PowerGel through my Speedfil A2.. I had a smooth T2 and quickly got on my Skechers GoRun Meb2’s. Once I started the run, I was surprised with how strong I felt in the first couple of miles. I did not want to push too hard, as I did not know how long the legs would hold up. I was able to monitor my pacing with my new Polar V800 watch! The longest run I had completed leading into the race was five miles, so I wanted to be more conservative verses aggressive! About two miles into the run, my legs were feeling great, but I was feeling a side stitch. I tried to ignore the stitch and focused on my breathing and my form. After I approached 3.5 miles, I did not notice the stitch anymore! 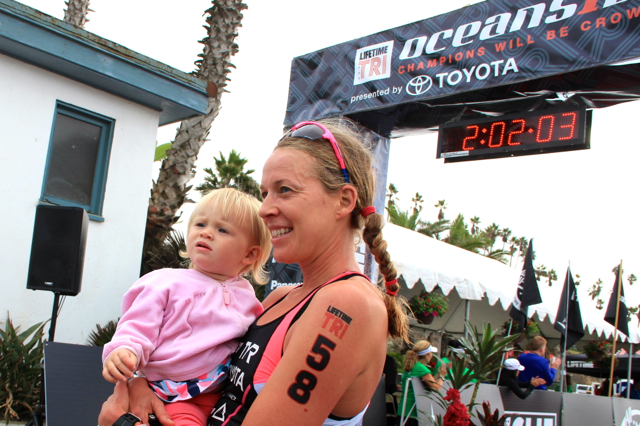 Paula Findley passed me early into the run, but I was focusing on staying smooth and relaxed. I realized with two miles to go, I had a shot at the podium! I finished the run feeling strong and was surprised with how I felt and pleased with my finish! 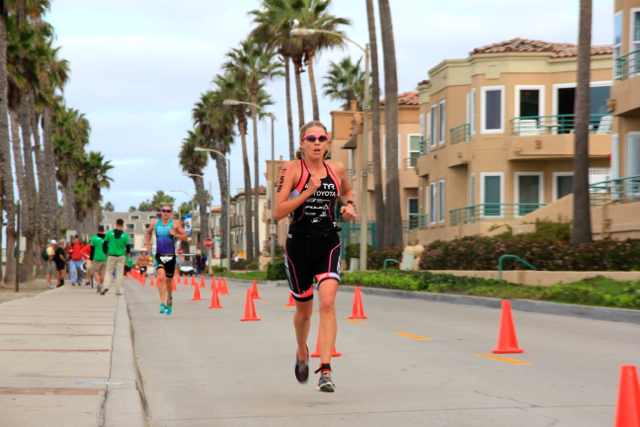 My finish at Oceanside secured a third place for me in the Lifetime Fitness Series. 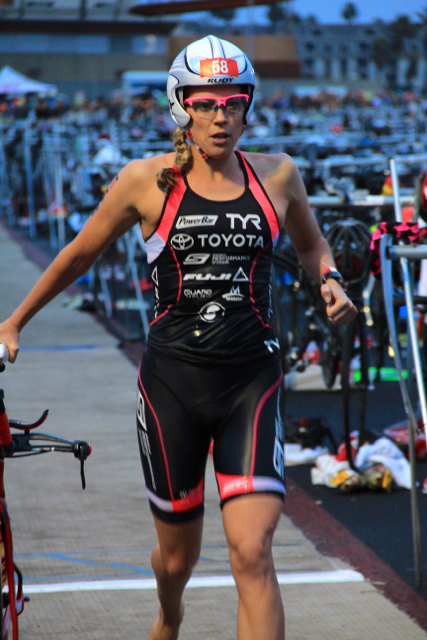 I had to miss four races due to injury, but placed 1st in Miami and CapTex earlier in the year. 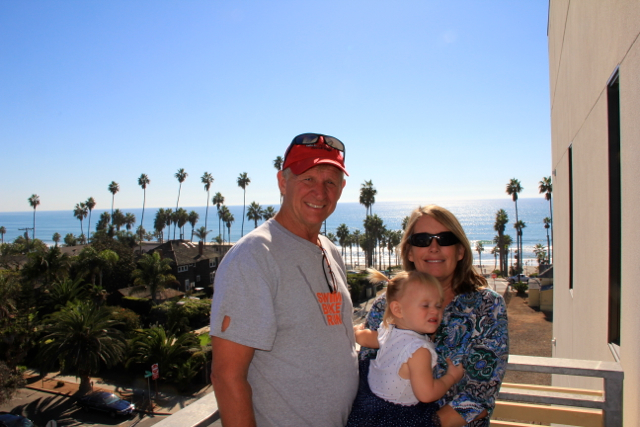 The day after the race, Nate, Caroline, my parents and I enjoyed the beautiful beaches of Oceanside. 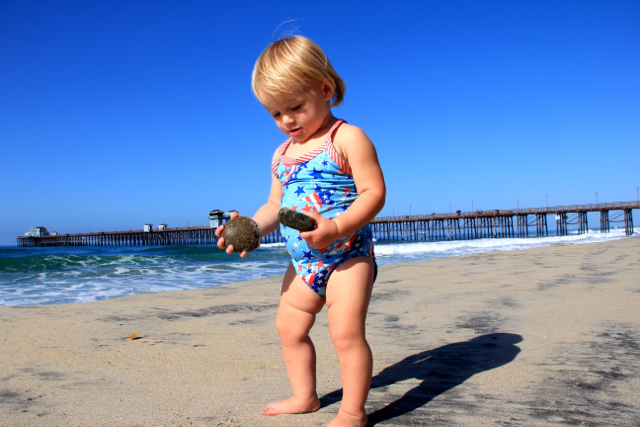 Caroline loved playing at the beach playground, gathering rocks and walking out on the peer. The weather could not have been better! The past few months have been very tough, especially mentally, but I am more than happy to finish the season on a high note. I had different goals for this race and happy to exceed them. I am just as excited with this third place as I was for each of my six wins earlier in the year. Thank you to all my friends, family, sponsors and supporters. A special thank you to Cathy McCredie, Amy Miller and Dr. Fitzmaurice who have helped me stay tuned up and heal during my time in Missouri. Thank you to my husband and coach who helped me stay focused during the mentally tough times and my daughter for giving me inspiration, laughter and the drive to do my best! I am looking forward for some recharging mentally and physically and then beginning to focus on 2015! One thing I have learned this year is to always believe in yourself, even when it seems like goals are impossible. Keeping your mind, body and soul in balance helps you to accomplish those goals every day. Best wishes to everyone for the remainder of 2014 and beyond.